A basic system for an electric fence around your garden. Using this complete set you can keep your dog or cat within your garden boundaries, and keep other animals out of your garden. This system is suitable for a 3-wire fence with a total length of 25 meters. The set consists of an energizer with wall clip and earth peg, 10 posts, 30 clips, 75 meters of wire, a door set for 3 wires and connecting wires. This kit is safe for children and pets, easy and quick to install and has a very low power consumption. A basic system for an electric fence around the aviary or on a wall/fence. Through this safe, highly effective electric fence system your aviary is out of bounds for cats and other predators. This system can also be used to stop other people’s cats from trying to enter over the fence or wall. 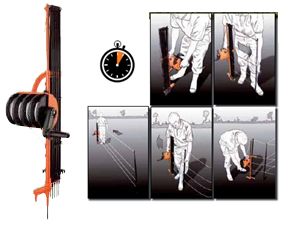 The set is suitable for a 2-wire fence with a total length of 25 meters and consists of an energizer with wall clip and earth peg, 10 clips, 50 meters of wire , a door set for 2 wires and connecting wires. This kit is safe for children and pets. Easy and quick to install and has a very low power consumption. A basic system for a fence around your pond. Through this safe, highly effective fence system your pond is a prohibited area for herons, prevents them from eating fish from your pond. The system includes an energizer with wall clip and 10 border posts, 20 clips, 100 meters of black plastic wire and connecting wire. The material is suitable for a 2-wire fence with a total length of 25 meters. The Gallagher Horse Kit is the ideal starter pack for a 100m horse fence. It includes a B11 battery energizer, 200m 12.5mm tape, 10 HD treadin posts, 1 gate handle, 1 gate anchor and 4 screw -in insulators. A complete poultry netting kit which will provide you with a highly effective deterrent against most predators. Poultry netting is a highly flexible, effective way of protecting your chickens. Available in 25m to make a 20ft x 20ft pen and 50m to make a 40ft x 40ft pen.